The VA Loan program was created in 1944 to help veterans and active duty military become homeowners. The government backs portions of loans through approved lenders, allowing veterans to get mortgages with favorable terms. If you’re interested in learning more about VA loans, here are the basics. 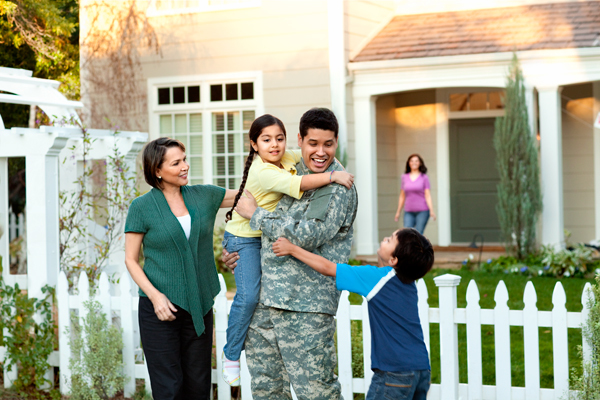 Both Veterans and active duty service members are eligible for VA loans on homes they will occupy. Members must have a good credit rating, sufficient income, a valid COE (certificate of eligibility) and meet specific service requirements. The biggest benefit of a VA Loan is the down payment, which is zero! That’s right, qualified borrowers can get 100% of the cost of a home financed if they haven’t been able to set aside a large sum of money for a down payment. Another significant benefit is not having to pay private mortgage insurance monthly, which is a payment typically required to protect lenders against default when a buyer doesn’t put down 20%. However, there is an upfront PMI fee required on all VA loans. The lender doesn’t require monthly PMI or a down payment for VA loans because the portion backed by the government assumes the risk on behalf of the service member. The DD-214 is a form for veterans which outlines specifics about their active duty, including dates, assignment and rank, separation information, and any decorations, awards or medals received during service. The form is needed to acquire a Certificate of Eligibility (COE), which verifies to lenders that you are eligible for a VA loan. Active duty service members submit a current statement of service signed by the commander of their unit or personnel office in lieu of a DD-214. Service members obtain VA Loans through typical lending institutions like banks and mortgage brokers who participate in the VA Home Loan Program. We highly recommend working with a lender that has experience in dealing with VA loans. It’s a good idea to try to get pre-approved for a loan after gathering your COE. It lets buyers know you are serious, and will give you a realistic idea of how much you’ll be able to spend. For more information on VA loans, visit the US Department of Veterans Affairs website at http://www.benefits.va.gov/.